Finding best available technologies for meeting energy needs today and tomorrow: energy efficiency, demand response,, solar, wind, electric vehicles, biofuels and smart grid. It’s all the innovations that make the energy we use more secure, clean, and affordable. The energy world's best hopes lie in what's happening in the digital realm, especially in data analytics. 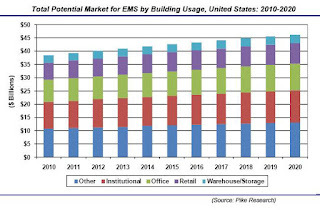 According to a 2009 report from Pike Research, the increasing application of information technology to the commercial building sector, together with changes in perception regarding energy as an asset, will drive a cumulative investment of $67.6 billion in Energy Management Systems (EMS) during the period from 2010 to 2020. By 2020, the cleantech market intelligence firm forecasts that annual EMS revenues in the U.S. will reach $6.8 billion. A Building Management System (BMS) is a computer-based control system installed in buildings that controls and monitors the building’s mechanical and electrical equipment such as ventilation, lighting, power systems, fire systems, and security systems. A BMS consists of software and hardware; the software program, usually configured in a hierarchical manner, can proprietary protocols, using such protocols, Recently, however, vendors are producing BMS’s that integrate using Internet protocols and open standard (see my blog article) such as DeviceNet, SOAP, XML, BACnet, LonWorks and Modbus. 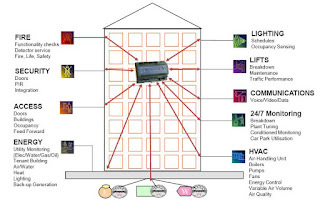 A BMS is most common in a large building. Its core function is to manage the environment within the building and may control temperature, carbon dioxide levels and humidity within a building. It controls heating and cooling, manages the systems that distribute this air throughout the building (for example by operating fans or opening/closing dampers), and then locally controls the mixture of heating and cooling to achieve the desired room temperature. A secondary function is to monitor the level of human-generated CO2, mixing in outside air with waste air to increase the amount of oxygen while also minimizing heat/cooling losses. As well as controlling the building's internal environment, BMS systems are sometimes linked to access control or other security systems. Fire alarm systems and elevators are also sometimes linked to a BMS, for example, if a fire is detected then the system could shut off dampers in the ventilation system to stop smoke spreading and send all the elevators to the ground floor and park them to prevent people from using them in the event of a fire. Access Control - Turnstiles and access doors controlling who is allowed access and egress to the building. Allows the building occupant to know who is in the building and prevent building access to any unwanted or uninvited people. Includes access control systems, portal control and hardware. Functions include: human inventory, asset protection, and traffic control. Actuators - A mechanical device for moving or controlling a mechanism or system. An actuator typically takes energy, usually created by air, electricity, or liquid, and converts that into some kind of motion. An actuator connect directly to the building control network and not to a controller and include damper and valve actuators and variable frequency drives. Application Specific Devices - An application specific device comes from the vendor with a pre-loaded application. In most cases the application can not be changed. The application will typically require the setting of configuration parameters such as set points, timing parameters, etc. Access to configuration parameters is an important issue. Controller - A device that controls the operation of part or all of a system. It may simply turn a device on and off, or it may more subtly modulate burners, compressors, pumps, valves, fans, dampers, and the like. Most controllers are automatic but have user input such as temperature set points, for example, a thermostat. Controls may be analog, or digital, or pneumatic, or a combination of these. Data Managers - Programmable devices without I/O. They perform supervisory logic, integration functions, central time schedules, trend logging for application specific devices and alarm handling for application specific devices. Device Level Network - A network dedicated to a specific protocol that provides for communication between devices and user interfaces. Generally copper wire but can be power line carrier, wireless or fiber optic. Device location and communication administration is managed by an engineering software tool specific to the communication protocol. DDC – Direct Digital Controls - The automated control of a condition or process by a digital computer. DDC is often used to control HVAC devices such as valves via microprocessors using software to perform the control logic. DDC receives analog and digital inputs from the sensors and devices installed in the HVAC system and, according to the control logic, provide analog or digital outputs to control the HVAC system devices. EMS – Energy Management System - A computer system which is designed specifically for the automated control and monitoring of the heating, ventilation and lighting needs of a building or group of buildings such as university campuses, office buildings or factories. Most of these energy management systems also provide facilities for the reading of electricity, gas and water meters. The data obtained from these can then be used to produce trend analysis and annual consumption forecasts. Fieldbus - A family of industrial computer network protocols used for real-time distributed control, now standardized as IEC 61158. A complex automated industrial system usually needs an organized hierarchy of controller systems to function. In this hierarchy there is usually a Human Machine Interface (HMI) at the top, where an operator can monitor or operate the system. This is typically linked to a middle layer of programmable logic controllers (PLC) via a non time critical communications system (e.g. Ethernet). At the bottom of the control chain is the fieldbus which links the PLCs to the components which actually do the work such as sensors, actuators, electric motors, console lights, switches, valves and contactors. Fieldbus works on a network structure which typically allows daisy-chain, star, ring, branch, and tree network topologies. Previously computers were connected using RS-232 (serial connections) by which only two devices could communicate. 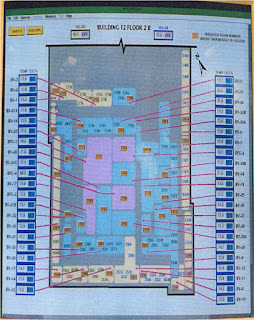 Field Bus Layer - The building controls device level. Gateway – A network node equipped for interfacing with another network that uses different protocols with translation tables. The job of a gateway is much more complex than that of a router or switch. Typically, a gateway must convert one protocol stack into another. A gateway may contain devices such as protocol translators, impedance matching devices, rate converters, fault isolators, or signal translators as necessary to provide system interoperability. It also requires the establishment of mutually acceptable administrative procedures between both networks. Gateways may take several forms: embedded in routers, software solutions or other control devices. A gateway gives you a limited view into a system. A very common transition point between the different protocols is between the building controls level and the IP level. HMI – Human Machine Interface – User Interface. The terms refer to the 'layer' that separates a human that is operating a machine from the machine itself and includes input and output. Irrigation Controls - Weather- or sensor-based technology uses local weather and landscape conditions to tailor irrigation schedules to actual conditions on the site or historical weather data. Instead of irrigating according to a preset schedule, advanced irrigation controllers allow irrigation to more closely match the water requirements of plants. These new control technologies offer significant potential to improve irrigation practices in homes, businesses, parks, and schools across the United States. Mechanical Controls - The first type of building controls introduced in the early 20th C. They relied upon human interaction to control the manual valves and dampers that controlled air and water flow. Peer Network – No single point of failure vs. older tiered systems. PLC – Programmable Logic Controllers - A digital computer used for automation of electromechanical processes. Unlike general-purpose computers, the PLC is designed for multiple inputs and output arrangements, extended temperature ranges, immunity to electrical noise, and resistance to vibration and impact. Programs to control machine operation are typically stored in battery-backed or non-volatile memory. Pneumatic Controls - Used distributed, pressurized air to automatically open and close the dampers and actuators that controlled the flow of air and water in a building. The presence of pneumatic controls means monitoring is not available for temperatures in the spaces, VAV box airflow, or reheat coil position. Pneumatic controls were state of the art in the 1930’s and they were a big advancement from mechanical controls. They are still used today (explosion proof areas, and have been installed as recently as 2000) Pneumatic systems are hard to maintain. Disadvantages include the lack of monitoring capability, no centralized control. Protocol - The language of communication. In a protocol, data is transmitted using specific: formats, transmission speeds and media. For two devices to communicate with each other, all three of these elements must match. RTU - Remote Terminal Unit - A microprocessor controlled electronic device which interfaces objects in the physical world to a distributed control system or SCADA system by transmitting telemetry data to the system and/or altering the state of connected objects based on control messages received from the system. Security Systems - Include cameras, Digital Video Recorders (DVR), video distribution and motion detectors. Sensor – Resistant signal most of the time. Most of the time wired, Application specific sensors connect directly to the building control network and not to a controller and include: conference room sensors, lighting level sensors and motion sensors. Setpoint - The target value that an automatic control system will aim to reach. For example, a boiler control system might have a temperature setpoint, that is a temperature the control system aims to attain. 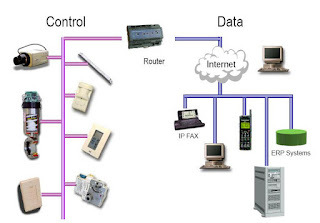 Single Control Network - Typically provided by a single manufacturer. All of the devices communicate with each other in a peer to peer manner. VAV - Variable Air Volume (VAV) is a type of HVAC system. The simplest VAV system incorporates one supply duct that, when in cooling mode, distributes approximately 55°F supply air. Because the supply air temperature, in this simplest of VAV systems, is constant, the air flow rate must vary to meet the rising and falling heat gains or losses within the thermal zone served. There are two primary advantages to VAV systems. The fan capacity control, especially with modern electronic variable speed drives, reduces the energy consumed by fans which can be a substantial part of the total cooling energy requirements of a building. Dehumidification is greater with VAV systems than it is with constant volume system which modulate the discharge air temperature to attain part load cooling capacity. Systems linked to a BMS typically represent 40% of a building's energy usage; if lighting is included, this number approaches 70%. BMS systems are a critical component to managing energy demand. 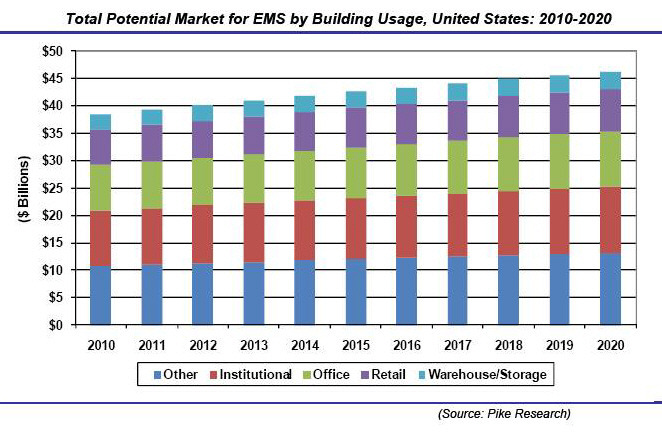 Improperly configured BMS systems are believed to account for 20% of building energy usage, or approximately 8% of total energy usage in the United States. Building Controls were sold as a complete system until the early 1990’s. Standards now allow best of breed implementations. However, some experts say that every building with an advanced control system is out of specification. Error Prevention - Prevent local system mishandlings including: improper thermostat settings, improper outdoor / parking lot lighting overrides, and improper signage lighting. Automated Demand Response (See my blog article) - Peak power demand management Scheduled load reduction or peak sharing (utility incentives.) The building automation systems in most sizeable commercial buildings are smart systems with computers and communications capability. Demand Response can interface to the BMS the way it would to a substation computer. So instead of saying set back the thermostat, that building automation computer could be saying, here’s my demand time shifting, what’s it worth to you, Mr. Utility. Integrated Access Control and Building Management. Building knows who you are and can change based on that. For example turn on the lights leading to your office and the VAV fan for your office when you enter the building on the weekend. This is not being done today. Access-initiated HVAC Control historically the access control systems are not often integrated with the building control systems. Performance Analysis - Review of trended building energy performance data leading directly to reduced energy use and increased comfort. Complexity - Buildings are complex, interactive prototypical machines. Intricate geometry compounds the problem. It is harder to connect systems that reflect the physical world than just the information world which makes open standards more difficult. It is hard to manage runtime algorithms. Specialized expertise is needed to set up the algorithms that control building equipment. Death by Trial - The building management market -- at least for Cisco -- has become a "death by trial" situation where engineers and other employees get sucked into lengthy, expensive, and potentially un-lucrative trials. Some residential networking companies have complained about how trials can become a burden. Building Performance Feedback - Generally know so little on how buildings actually perform. Plug Load - How to include plug loads – building and tenant IT people? Green leases? Financial incentives? Instability in Digital Controls and Excessive Valve Cycling. For example, direct digital control system’s control of supply air temperatures in two air handlers. The trending data showed that the preheat valve cycled every 15 minutes between 75% open and full closed. This resulted in a variation in supply air temperature of 9 or 10 F in the heating mode for the air handlers. This cyclic variation in supply air temperature makes control of space temperatures difficult, and potentially causes unnecessary heating and cooling. Inefficient Nighttime Operation – For example, air handlers operated continuously although the building was empty at night. The chiller also operated at night, as well as the boiler, performing simultaneous heating and cooling. Much of the lighting was also found to operate after hours. Faulty Thermostats - One room might be 79ºF while another similar room was 70ºF. Broken VAV Actuators. - VAV boxes may have inoperative actuators on the air dampers or hot water valves which would create a significant amount of unproductive energy use in heating, cooling and distributing air unnecessarily. Discomfort in the building will lead to the chiller being manually started during some hours when comfort could have been maintained without chilled water, given properly operating zone controls. Non-delivery of chilled water. Supply air and chilled water temperatures outside of the expected performance range. Chilled water from the central plant may not be drawn into the building loop. As a result, the building air handlers can deliver air at an elevated temperature, causing them to operate at high speeds to meet the cooling load of the building. Cisco - San Jose - The Cisco Network Building Mediator provides the intelligence to interconnect and enable building systems such as heating, ventilation and cooling (HVAC), lighting, electrical, security, and renewables over the IP network to build smart and energy-efficient buildings of the future. Top managers for CISCO's Virtual Power Plant (VPP) business segment come from Southern California Edison (SCE), a utility whose large-scale efforts in DR – representing over 1,000 MW of DR capacity – and development of up to 500 MW of utility-owned distributed solar PV distributed throughout its service territory in 1 to 2 MW distinct systems – represent the perfect utility partner to launch such a new business enterprise. With its “Building Mediator,” Cisco is also targeting this network device on energy-intensive corporate buildings, a venture with downside risk. On August 10, 2011 Cisco announced it is scaling back its energy management business. For building energy management, this means Cisco is actively pursuing several strategic options for Cisco’s Network Building Mediator and Mediator Manager product line, with an emphasis on minimizing the impact on current customers, partners and employees. For energy management in the home, Cisco will transition their focus from creating premise energy management devices to using the network as the platform for supporting innovative applications and architectures that will improve their customers’ value proposition in the consumer energy management market. Cisco's failure in building management seems in large part the result of trying to do too many things at once. Cisco approached energy the same way Intel approached communications in the late '90s and 2000s: We are big and have lots of money, therefore we will win. The strain of trying to launch a new product line while core product lines lagged definitely helped the decision. Still, the exit will likely send a chilly breeze through the efficiency world. Cisco is better than average when it comes to integrating new technologies. If they can't do it, can Microsoft, Intel or IBM, which have all recently launched efforts to get into commercial building management? Cisco explored how to move into the smart grid partly by buying startups. Cisco bought wireless networking software company Arch Rock in 2010 and Richards-Zeta Building Intelligence in 2009. Ed Richards, the former director of worldwide business development at Cisco and one of the founders of Richards-Zeta, who spoke frequently to the press and at conferences on behalf of Cisco's strategy recently left the company. Distech Controls, Brossard, Quebec - Designs, manufactures and markets building automation solutions for HVAC, lighting and custom applications, promoting energy and cost efficient operation of buildings, including DDC controls, wireless sensing and system software, based on interoperable communication protocols. Established in 1995, Distech Controls is headquartered in Quebec, Canada, with offices in Canada, the USA, Europe, Asia and the Middle-East. Honeywell - With both Honeywell WEBs-N4 and WEBs-AX, Honeywell has the Niagara Framework-based building management solution (BMS) that takes all aspects of your building and occupant needs into consideration to maximize energy efficiency and make management of your facility simpler and more user-friendly. Add the power of Spyder®or Stryker controllers, and you'll have the versatility to choose from a collection of best-in-class control products ready to evolve and meet all of your HVAC, lighting and security needs. AutomatedBuildings - This site is an e-zine on building automation and controls. Connectivity Week 2010 – Building Automation Boot Camp basic and necessary understanding of the building automation industry, from the basics of control and automation systems, through to integration and the use of automation for energy management. As the name suggests, this technique is used for opening and closing doors with external controls. Many manufacturers and designers of security systems have introduced different variations of this popular security. Keypad Management Solution: Stand Alone – Supports two (2) doors and 1,350 access credentials. Unlimited controller keypads can be installed sharing the same access credentials. 1) High security anti-tamper design. The keypad controller is installed indoors while the proximity readers are installed outside the doors to be controlled (no access to relays from outside). 2) Controller Keypad controls up to two (2) doors. An unlimited number of controller keypads can be installed on various locations, allowing users to gain access with the same credentials. This blog includes embedded "reposts". I'm doing this mainly to learn and secondly to share. If I were writing these posts for college credit, I'd probably be expelled. (lol) I do try to do a good job on footnotes, with lots of links to relevant material. Questions, comments and corrections are encouraged.